The Four Cs of 21st Century Learning are skills students need to develop to successfully navigate middle school, high school, college, career, and beyond. This opportunity is available to all NR21 educators in Southern Nevada. 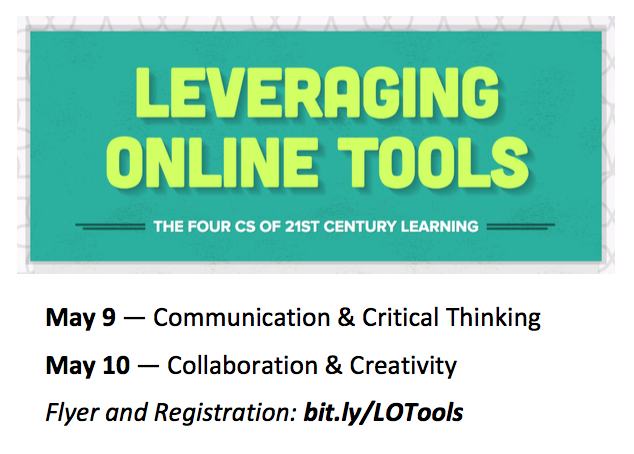 Check out the flyer and registration form: bit.ly/LOTools. On May 9 participants will learn how to use digital notes, Animoto, and Lucidchart to foster communication and critical thinking in the classroom. On May 10 participants will learn how to use collaborative digital notes, Padlet, and WeVideo to foster critical thinking and creativity. See you at the trainings! Attention Southern Nevada NR21 Teachers! The Southern Nevada Digital Learning Summit is fast approaching! Join us Saturday, April 29, 2017 from 8:30 A.M. to 3:30 P.M. at Bob Miller Middle School for a day of EdTech and Professional Learning. Space is limited, so register for the Summit today! Collaboration within WeVideo is easy because the program allows teachers to create both collaborative and shared projects. WeVideo has made it even easier to allow students to collaborate on a project with its "combine edits" feature. Now teachers and students can combine many edits into one finished video with the click of a button. From the project menu, open the project. Select all the videos you would like to combine. Right-click on the selected videos. Click "combine edits." Select the order of the clips. That's it! A new window will open with all of the video edits combined into one. Watch the video below for a tutorial on how to combine edits within a WeVideo project then work the move into your next lesson! How are you incorporating collaboration, communication, critical thinking, and creativity, or the Four Cs of 21st Century Learning, into your lessons? Slides and PowerPoint presentations are classroom staples used to transfer knowledge from the teacher to the student. This "sit-and-get" style of information input, however, can be very teacher-centered. But note taking doesn't have to be so one-sided! You can increase your use of the Four Cs by having your students create concept maps of their class notes. Concept maps help students organize their thinking, and are made up of a series of terms or concepts linked by connecting phrases. The concepts are enclosed within a rectangle, which are called nodes. Students draw arrows and create connecting phrases between the nodes. See the yellow graphic, made with Lucidchart. 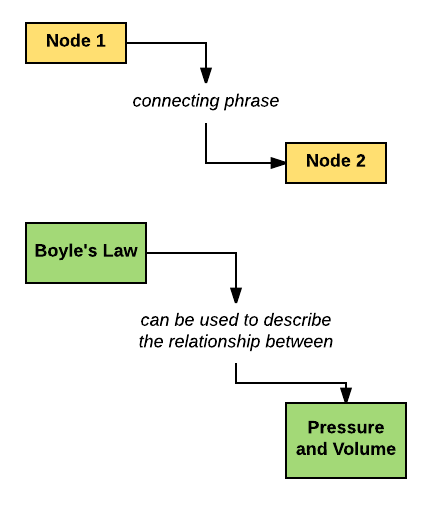 I teach my students to build simple concept maps by imagining the two nodes and the connecting phrase are parts of a sentence. 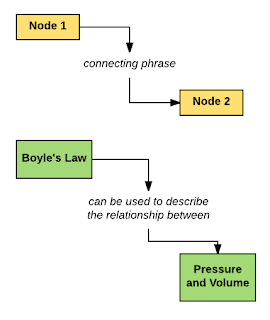 Node 1 is the beginning of the sentence and node 2 is the end of the sentence. The connecting phrase links the beginning with the end. Look at the green graphic for an example of a simple concept map. Note how the direction of the arrow tells the viewer which direction to read the concept map. Concept maps can be used as a pre-assessment tool, too. Instead of creating a K-W-L chart, ask students to open Lucidchart and create a concept map on everything they know or think they know about the topic of your upcoming unit. Reading students' concept maps before teaching will reveal misconceptions the students may have. 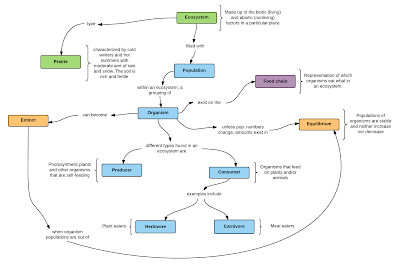 Since Lucidchart is a digital tool that allows students to easily edit their work, they can go back and correct their concept map as their learning grows throughout the unit. Because concept map creation allows students to be active participants in their own knowledge construction, concept maps are often used in constructivist classrooms. Concept mapping will increase your use of the Four Cs because your students must use their critical thinking and creativity skills to create their concept map throughout a unit. Students will collaborate and communicate with one another when they use Lucidchart to create and share their concept maps. 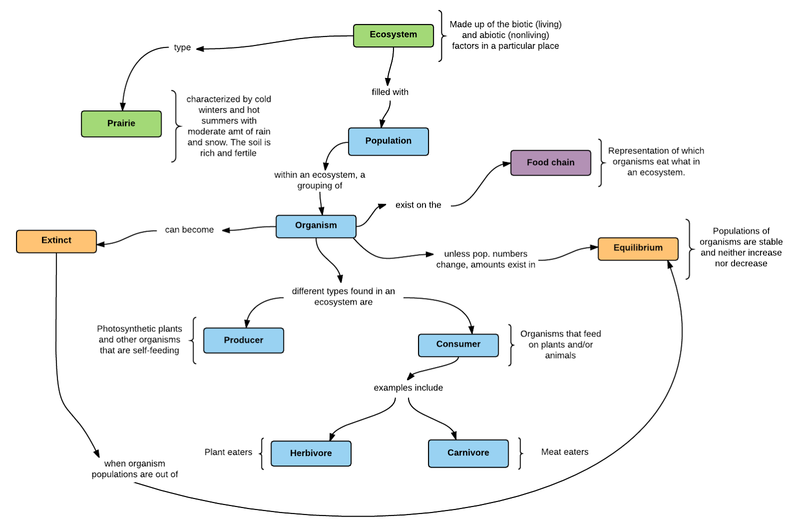 Practice making a couple concept maps in Lucidchart first and then try it out with your students for your next unit. When Chrome Extensions Go Bad- "Extension Viruses"
Who knew extensions could be bad or turn bad? I actually never really thought that much about it until yesterday! Yesterday, I turned on my computer and it freaked out identifying a virus. My anti-virus software nailed it down to the "Web Paint" extension. I immediately disabled and removed the extension from my machine and did some virus clean-up. This morning, while checking my Twitter feed, I came across an article titled "When Chrome Extensions Go Bad" written by John Sowash on his blog. It specifically mentioned the "Web Paint" extension, which in my early morning hours before a Chai Tea, helped me to begin to connect the dots between my experience yesterday and the threats of extensions causing security risks. Read the blog post to learn more about how best to protect yourself and what to do when you have an extension virus. Out with Venn Diagrams! In with Comparison Tables! I have a problem with Venn diagrams. Not only do they not translate very well in a digital classroom, but they are also hard to use! The intersection of the two circles of a Venn diagram, the almond-shaped vesica piscis, arguably is the most important part because this is where students would find similarities between the two concepts. Regardless of how the student created their Venn diagram, they often made this area too small to write in. "There has to be a better way?!" you ask yourself. The comparison table allows students to easily compare and contrast two concepts without having to know what a vesica piscis is. Even more, the comparison table is a perfect digital replacement for the Venn diagram when teachers use Google Docs to create them. And since Docs can be shared between students, comparison tables increase collaboration and communication, both 21st century skills we should be incorporating more of into our lessons. 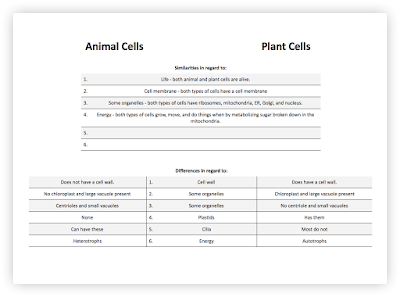 Open this comparison table that describes the similarities and differences between plant and animal cells. Note how students are asked to identify the general similarity between the two cell types like "organelles," and explain how they are similar: "both types of cells have ribosomes, mitochondria, ER, Golgi, and nucleus." Likewise for the differences. 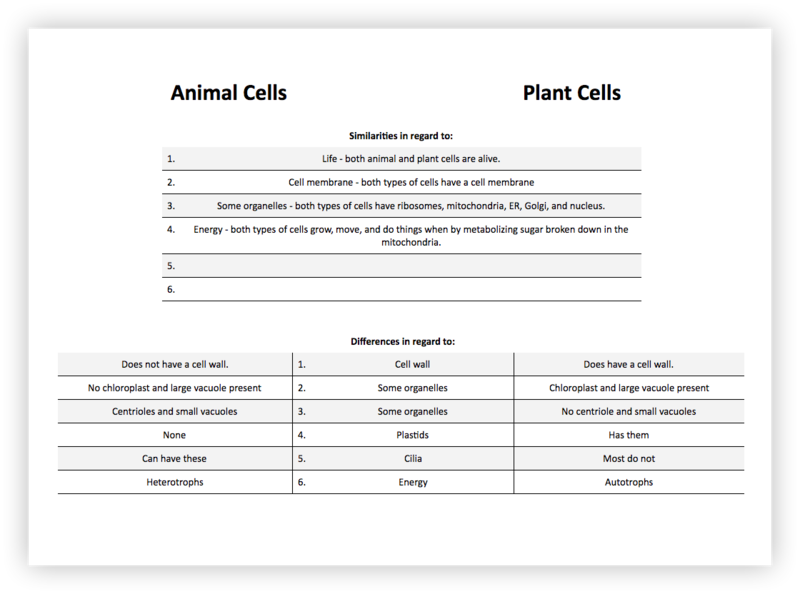 Students differentiate in what regard plant and animal cells are different and explain their reasoning. Make a copy of the comparison table and start identifying similarities and differences with your students today!